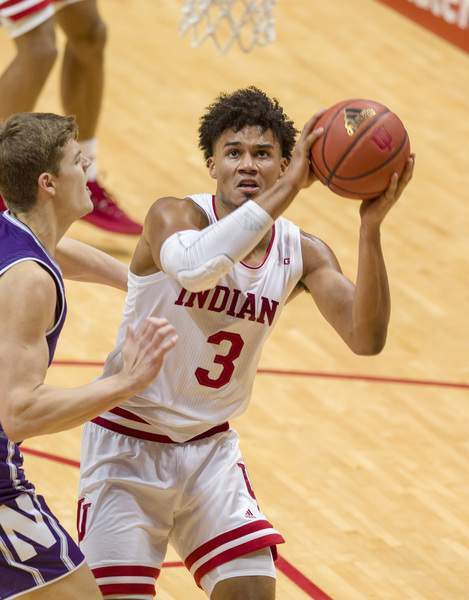 Associated Press Indiana forward Justin Smith said he expects plenty of close battles in the Big Ten after the Hoosiers beat Northwestern 68-66 Saturday. Indiana has not fared well on the road this year. The Hoosiers have played two games outside of Assembly Hall – against Duke and Arkansas – and have lost both of them, turning the ball over a combined 38 times. They'll have another chance to prove they can get the job done away from Bloomington tonight when they travel to Penn State for the second of two early-season Big Ten games. The Nittany Lions are the defending NIT champions. Indiana (6-2, 1-0 Big Ten) opened its conference schedule Saturday with a hard-earned 68-66 win over Northwestern in a game that was tied 29 times. Indiana coach Archie Miller said he expects plenty more games of that nature this season. Sophomore forward Justin Smith echoed his coach's sentiment about the quality of the Big Ten this season. The Hoosiers might enter the next “dogfight” without senior forward Juwan Morgan, a team leader who is among Indiana's top two in scoring, rebounding, blocks and field goal percentage. Morgan had to be helped from the court at the end of the Northwestern game with a leg injury, and Miller would only say during his radio show Monday that the forward was with the team after the game and had had X-rays. Losing Morgan would put more of the load on freshman Romeo Langford to provide scoring punch and center De'Ron Davis to play big minutes on the interior, even though Davis is still recovering from an Achilles tear. Even if Langford and Davis raise their games, Morgan's loss would still be a blow to the Hoosiers because of his all-around excellence and ability to create his own shot when the offense becomes stagnant. Penn State seems especially well-positioned to exploit Morgan's potential absence. Nittany Lions leading scorer Lamar Stevens averages 22.4 points, second in the Big Ten, and 8.6 rebounds. He'll be a difficult cover for Davis, who is still working his way back into game shape and is averaging just 12.6 minutes per game. Penn State (4-3, 0-1) is also working a talented big man back into its rotation. Mike Watkins, a 6-foot-9 defensive stalwart, led the Big Ten in field goal percentage (68.5) and was second in rebounds per game (8.9) and blocks per game (2.3) last season before missing the final nine games of the year with a knee injury. Watkins was held out for the first five games of the season but returned to help the Nittany Lions to a win over No. 13 Virginia Tech on Nov. 27. He has played 32 minutes in two games. Indiana hasn't started 2-0 in Big Ten play since 2015-16, when it went on to win the Big Ten title.